Bernardo Bertolucci’s Novecento is an epic like no other. Given complete freedom and an enormous budget following the extraordinary critical and commercial success of Last Tango in Paris, the young Italian director attempted to encapsulate the entire twentieth century in a violent, sexually charged and operatic film that sprawls across five mesmerising hours. 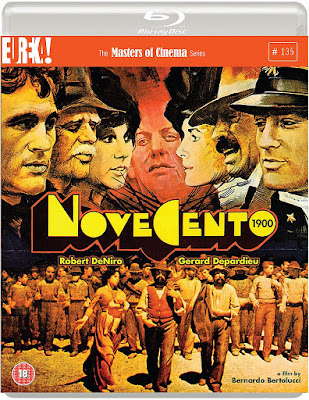 I’ve been fascinated by Novecento ever since I first saw it at a memorable screening during the BFI’s Bertolucci retrospective in 2011, and so I was thrilled to be asked to write a new essay on the film for Eureka’s new blu-ray as part of the Masters of Cinema collection. The film looks incredible in this format and I’m very proud to be part of such an exciting release. I've also been working with Arrow Films recently for a forthcoming blu-ray release, and I'm looking forward to announcing more details on that one soon.